Looking for GinGKo Press, Inc. --​Publisher of Art Books? click here. 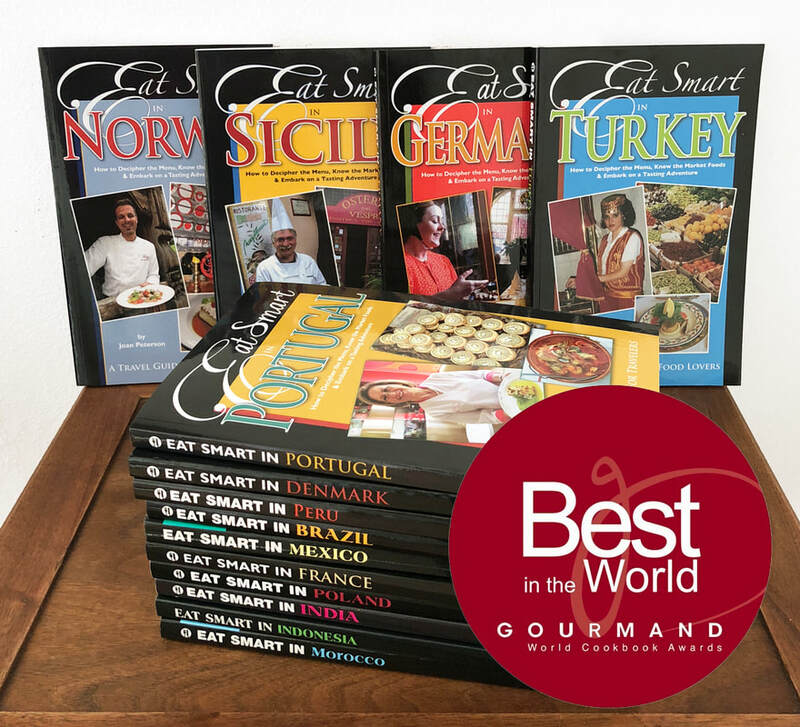 Award-Winning Eat Smart Culinary Travel Guidebooks by Ginkgo Press, Inc.
​​We also lead culinary tours around the world. Your Leading Authority on Culinary Travel since 1993. Join us in getting to the heart of the culture through an exploration of its tantalizing cuisine. Sample the infinite variety of regional specialties in their natural setting. Delve into the secrets of local dishes by participating in cooking classes. Also included are talks on culinary topics and visits to bustling markets to learn about the herbs, spices and condiments that are prevalent in regional cookery. We also see the major tourist sights, yet still have time to shop and relax along the way. You’ll come away with a knowledge of the culinary traditions and a deep appreciation of the magnitude of history and culture. Our Culinary and Cultural Tours are perfect for those with special dietary needs. Because we work closely with all of our chefs on our tours, we can easily accommodate dietary choices and restrictions. Do you have limited mobility? We can make special arrangements to accommodate most limited mobility situations. Please ask when inquiring about our tours. Intertwining history, geography and diet, the award-winning EAT SMART culinary travel guidebook series published by Ginkgo Press educates travelers and takes them to the heart of a culture, through an understanding and appreciation of its cuisine. The guides have two extensive dictionaries (one for menus and one for markets), authentic recipes from chefs to be savored as a preview or reminiscence of one's visit to foreign destinations, as well as the low down on regional specialties, useful phrases, and travel and shopping trips. Don't leave home without these compact but very complete guides to what's on the menu, what's in the market, what's on your plate and what you can ask for as you travel. Due to an abundance of demand, we are offering two more "Eat Smart in Sicily" dinners with "Best Culinary Travel Book Series in the World" award winning authors and chefs at vomFass/Delectable on University Avenue. Join culinary expert and local publisher, Joan Peterson, for an encore of the hugely popular Dinner with the Author "Eat Smart in Sicily. Executive Chef Edward Chwae will be preparing delicious dishes inspired by the book and pairing each dish with traditional Sicilian beverages. Joan will discuss the dishes, Sicilian food from a historical standpoint, and her experiences in Sicily. Join us for a memorable family-style Sicilian dinner! PLUS you will receive your own copy of "Eat Smart in Sicily!" Couples may choose a second book which covers Germany, Brazil, Denmark, Mexico, Poland, India, France, Norway, Turkey, Portugal, or Peru.